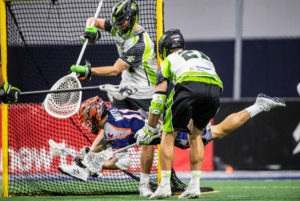 It was a historical and somewhat mystical night on August 11 for the sport of lacrosse and its burgeoning community where 6,124 fans headed to The Star in Frisco, Texas to watch their first place Dallas Rattlers (12-3) play host to the New York Lizards (8-7) in their first Major League Lacrosse playoff game. Dallas took on the only team who had defeated them at home in a comeback victory on July 29 by the score of 13-12. This was only one of their three losses they had not avenged yet. When the final buzzer sounded, the Rattlers would defeat the Lizards 15-12 and advance to the MLL Championship game on the 18th of August in Charleston, South Carolina. They will take on the Denver Outlaws (9-6) having defeated them twice this season. This being Dallas’s first championship appearance, while Denver will play in their third consecutive MLL Championship game. The excitement and fervor of the Rattler fans was matched only by the intensity and determination of the Rattlers players and coaches. The Rattlers opened up the scoring at the 1:42 mark of the first quarter with rookie sensation Ben Reeves (2G, 1A) working behind the cage, driving right from the “X” and then quickly switching to his left, passing the ball to Ty Thompson (2G) who was able to finish with the score netting his 37th goal of the season. Jordan Wolf (2G, 2A) would score next and set the stage for the Rattlers first playoff victory in their brief and exciting history. League leading scorer Rob Pannell (3G, 2A) would score the first goal for the Lizards, unassisted at the 7:50 mark making it 2-1. Dallas was ahead and that would be the closest this contest would be. At 8:11 the next goal was the clearly a highlight reel goal. Rattlers D-pole Joel White (2G, 10GB) would take the ball from behind the Lizards cage and beat one of the MLL’s best defenders, Matt Landis (5GB) and launch into a superman dive from behind GLE (goal line extended) delivering a backhand flip shot past Lizards goalkeeper Drew Adams (11SV, 1GB) to drive a dagger into the heart of the Lizards putting Dallas ahead 3-1 and in the driver’s seat. The first quarter would end with the Rattlers ahead 6-1, a lead they would not relinquish. At the 1:56 mark in the second, Jake Bernhardt (3G, 1A, 0-1FO) would score for New York bringing them to within four, but Dallas still held the lead at 6-2. White would score his second of the game at the 4:26 mark, further sealing the deal for Dallas. At the half the Rattlers were ahead 9-5. In the third quarter both teams would score four goals apiece making it 13-9 with Dallas still ahead. Dallas would not let the Lizards back into the game in the fourth as they outscored the Lizards 4-3 making it 15-12, and dashing the Lizards hopes of making it to the championship game in Charleston, S.C on August 18th. Keys to the Rattlers victory included outstanding defensive play as usual; goalie John Galloway (12SV, 10GB) leading the charge; FOGO Drew Simoneau was spectacular (1G, 10GB, 24-31FO); and lest we not forget their normal myriad of offensive scorers with 10 players, including D-pole White scoring at least one goal apiece. The Rattlers take on Denver this Saturday in South Carolina. This is of course Dallas’s first appearance while the Denver Outlaws will make their fourth appearance in the last five seasons. The game will be streamed live on ESPN News and promises to be an epic battle of two of the most talented and passionate teams in MLL history.